“In case you haven’t noticed, long-established political parties across the democratic world are blowing up, with Britain’s Labour Party just the latest to fracture. Could America’s parties be next? Could we have our first four-party election in 2020 — with candidates from the Donald Trump far right, the old G.O.P. center right, the Joe Biden center left and the Alexandria Ocasio-Cortez far left all squaring off, as the deepening divides within our two big parties simply can’t be papered over any longer? It’s not impossible. Flames reached the backyard of a home in Lake Elsinore, Calif., last week. “There is an assumption that the 2020 presidential election will be business as usual: Donald Trump will run on the economy, social issues and immigration, and the Democratic candidate will run on income inequality, Democratic socialism and Trump’s character — the 2020 version of right-left U.S. politics. “If your puppy makes a mess on your carpet and you shout “Bad dog,” there is a good chance that that puppy’s ears will droop, his head will bow and he may even whimper. In other words, even a puppy acts ashamed when caught misbehaving. That is not true of Donald Trump. Day in and day out, he proves to us that he has no shame. We’ve never had a president with no shame — and it’s become a huge source of power for him and trouble for us. “That leaves Mattis as the last man standing — the only one who has not been infected by Trump’s metastasizing ethical cancer, the only one who has not visibly lied on Trump’s behalf, and who can still put some fear into Trump. Well, Secretary Mattis, here’s some free advice to the last man standing: Don’t just stand there. If you just stand there, you’ll be next. Because Trump and Sanders will be looking to enlist your old uniform next in their defense — that is, if Trump doesn’t throw you under the bus first to escape responsibility for the bungled operation in Niger.Secretary Mattis, we don’t need any more diagnosis of the problem. We need action. And I am not talking about a coup. I mean you need to lead McMaster, Tillerson and Kelly (Pompeo is a lost cause) in telling Trump that if he does not change his ways you will all quit, en masse. Trump needs to know that it is now your way or the highway — not his. That is how you talk to a bully. It’s the only language he understands.Tell him: No more ridiculous tweeting attacks on people every morning; no more telling senators who forge bipartisan compromises on immigration or health care that he’s with them one day and against them the next; no more casual lying; no more feeding the base white supremacist “red meat” — no more distracting us from the real work of forging compromises for the American people and no more eroding the American creed. 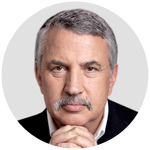 David Lindsay: I’m afraid I agree with Tom Friedman. I second this piece.